APC AP5017 rackmount tft monitor kopen? | That's IT! Nieuw in originele APC-verpakking voor een absolute bodemprijs, OP=OP. Standaard internationaal toetsenbord met QWERTY-indeling. 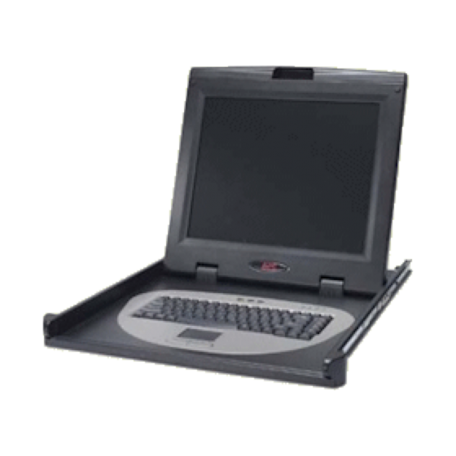 The APC AP5017 is an integrated keyboard, 17” monitor, and mouse in a compact 1U design that allows a KVM switch to be mounted in the rear of the device. The device is easily installed and minimizes support and maintenance costs.. The ultra-thin LCD screen, touchpad technology, and easy-to-install slide rails combine to form a high-quality, streamlined solution built for server management. The AP5017 can be used in a variety of IT environments, from computer rooms to large data centers.